Happy Saturday fellow Gooners. Hoping you’re all set to have a good one. I’m off to the south coast for a little weekend away with the Management so as little football as I can possibly muster. I still managed to catch a bit of the Leicester/Newcastle game and of course Leicester – who we’re due to play in a few weeks – were wasteful and blunted against a Newcastle side who are just about safe now. We all know that the Leicester team that played last night will clearly turn into the very best hits of Guardiola’s Barcelona, Bayern Munich and Man City all rolled in to one when they play us though, right? As for us, I guess we can just be pleased that after the debacle at Everton we have players returning to give us our performance against Napoli that we got. I’m now crossing everything that the XI that started the game on Wednesday have all been cryogenically frozen ahead of the game against Wolves, especially as Arsenal’s odds have gone up considerably. AT this stage of the season limbs start to ache given the football that has been played and with Sokratis out on Monday night through suspension Emery will be forced in to at least one change, but I just hope he isn’t forced in to anything else through fatigue, etc, etc. 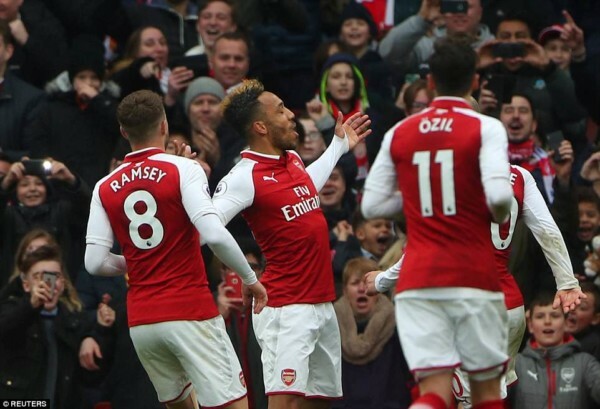 I also hope that we see the ‘Fab Four’ again on Monday night – Ramsey, Ozil, Lacazette and Aubameyang. As James Olley of the Evening Standard pointed out yesterday, when those four have all played together, we do tend to win football matches. And that is very much plat de jour for us with the remaining games that we have. It’s seems kind of obvious when you think about it because they are the best players in our squad, but I also wonder if the timing is having a big impact too. At a time where many players are starting to feel the wear and tear of a full season, let’s not forget that Ramsey and Ozil have been out of the team through injury or just being dropped, so the fact that Emery is bringing them back in to the fold and they are giving us better performances might be linked to their own fitness. Rambo has always been one of those people who warms up as the season progresses and if he stays fit he always needs a few games to get up to speed, whilst Ozil has always started strongly and faded a wee bit towards the end of a season it feels. I have no data to back this up other than gut instinct, it’s just an observation from my untrained eyes. But perhaps the freshness in some of these players is giving them the edge. The challenge Emery has is keeping them fresh but also ensuring that we remain competitive and the fact we play Napoli just a few days after Watford will be fresh in Emery’s mind I think. So I don’t know about you, but I think we might see another rotated side on Monday, even if just a little, with one eye on Thursday’s away leg in Naples. And the trouble that brings is that Arsenal don’t have a squad compiled for the GDP of a small country like Man City’s, so fighting on multiple fronts is difficult, especially given the fact we’ve already got three players out of the squad with long term injuries (Welbeck, Holding and Bellerin). We’ve got a decent squad but take out those players for the season and then when you get knocks even for one or two week’s for players it starts to affect the team because you end up with players like Elneny playing more regularly and Guendouzi starting to run out of steam at the end of the season. But hopefully Unai can find a balance for Monday night that ensures we’ll have the team also ready for Thursday. Before I go though, a quick word on the racism that one Arsenal fan used and was filmed saying at the ground on Thursday night. Auba has briefly spoken up about it and Arsenal rightly moved quick yesterday to launch an investigation in to who it was and who said it. It’s 2019 for crying out loud and this stuff is still happening. We all pointed fingers at Tottenham for somebody behaving appallingly at the Emirates when Auba scored towards the end of last year, but if we think that our fanbase doesn’t have any morons in it then we’re naive; racism is still prevalent in society and the best way to deal with it is to act swiftly, to continue to punish the offenders and also to ensure that younger children who are growing up with the world of football around them know that such behaviour is unacceptable. It’s a cultural thing and perhaps even an age thing and I like to think that as we as a society evolve, the more people publicly deplore this kind of behaviour, the more future generations will recognise that it is unacceptable and hopefully eradicate. But it isn’t a problem going away any time soon. That’s me for another one. Have a great day peeps.